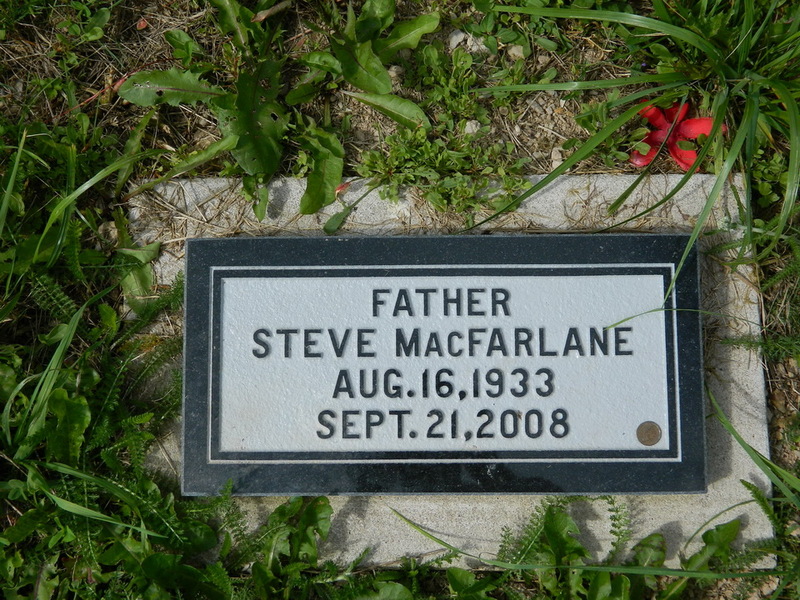 Steve MacFarlane 75, Glengarry Road, Big Pond - It is with deep sadness, that we the family announce the peaceful passing of Steve MacFarlane, which occured Sunday, Sept. 21, 2008, surrounded by his loving family at the Cape Breton Regional Hospital, Sydney. 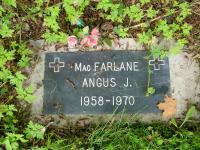 Born in Glace Bay, he was the son of the late James and Cassie (MacNeil) MacFarlane. A truck driver by trade. In his pastime he was a backyard mechanic. He enjoyed going on roadtrips with his family, playing darts and bingo and being around horses. 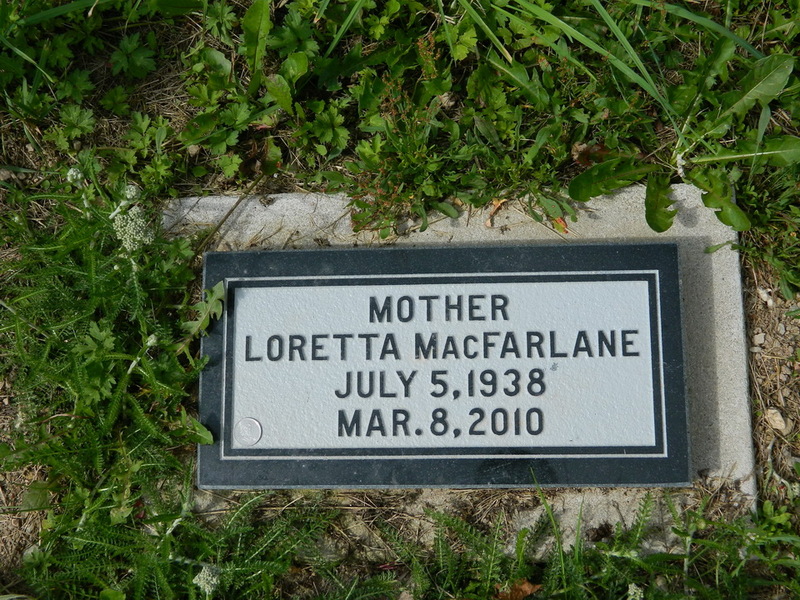 He was a member of St. Mary's Church, Big Pond and the Big Pond Volunteer Fire Department. (Cheryl) MacDonald as well as several nieces and nephews. He was the last surviving member of his immediate family. Besides his parents, he was predeceased by his son, Angus, sisters, Annie, Isabel, brothers, Angus, Willie, Tony, Dougall, Allie, Jimmy and several siblings in infancy. [S427] CBGHA, online www.cbgha.org, Excerpts from 2011-October. St. Mary's Cemetery, Big Pond. Holden Watts, Marley Watts and Jacob Hollohan. There will be no visitation. for Jenny will be held 10 a.m. Tuesday, April 28 in the Parish of St. It is with sadness we announce the passing of Pat Usher 'Stampy', as his friends and family called him, on Saturday, May 17, at the QE2 Halifax Infirmary, Halifax, N.S. Born in Sydney, he was a son of the late Alex and Bertha (Moulton) Usher. Pat was employed at various dealerships and garages throughout Cape Breton as an Automotive Technician. 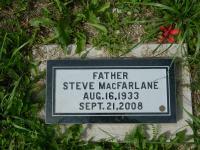 He enjoyed playing guitar and darts and was a member of several dart leagues at the New Waterford and Dominion Legions. Pat always cherished the time he spent with his friends John Coish and Francis Penny in John's garage on Kaneville Road. His greatest joy, however, came from spending time with his children and grandchildren. He will be missed by all who knew him. Surviving are his partner, Judy Christiansen; daughters Cherie (Blair) Roach, Victoria Mines, and their children Luke, Meagan, Colin, Renee and Ryan; Tracy (Adam) Watts, Halifax, and their children Holden and Marley; son, Patrick (Lacey), New Waterford, and their children Jacob, Gavin, Vance and Lila; brothers Billy (Estelle), John, both of Edmonton, Nick (June), Victoria Mines, Alex (Dorothy), New Victoria; sisters Ann (Allan) Ayre, Sydney, Willena (Ron) Ryder, Dartmouth; sister-in-law, Lena; close friends John Coish and Francis Penny. Besides his parents, Pat was predeceased by his wife of 37 years Jenny (Gillis); brothers Jimmy and Bobby. There will be no visitation. Cremation has taken place under the care and direction of V.J. McGillivray Funeral Home, 380 Smith St., New Waterford. A funeral mass of celebration will be held Wednesday, May 21 at 10 a.m. in the Parish Church of St. Leonard, Mount Carmel Ave., New Waterford. Burial will be in St. Agnes Cemetery with a luncheon to follow at St. Leonard's Hall, Convent Street, New Waterford. Donations in his memory may be made to a charity of one's choice. [S432] Obituaries from The Cape Breton Post Newspaper, Obituary of Pat "Stampy" Usher, after May 17th, 2014.